Kansas Secretary of State Kris Kobach speaks with reporters before his election night watch party for the Republican primary for governor on Tuesday in Topeka. Kobach is the state's top elections official. Colyer sent a letter earlier Thursday accusing Kobach's office of "giving advice to county election officials" and "making public statements" that are "inconsistent with Kansas law and may serve to suppress the vote in the ongoing Kansas primary election process." Colyer requested Kobach recuse himself and appoint Kansas' attorney general Derek Schmidt to take his place in the process. As secretary of state, Kobach is the head elections official in Kansas. He had earlier resisted requests to recuse himself, saying his role in elections is mainly symbolic and the vote-counting is done at the county level. Kobach continued to make that point on CNN Thursday, though said he would remove himself in response to Colyer's request. "There's really no point in doing it, because the secretary of state doesn't actually have any role in the counting of provisional ballots or in any recount," Kobach told CNN's Chris Cuomo. However, he added that he would accede to his opponent's request. Differences between vote tallies reported by county election officials and the secretary of state's office emerged in reports Thursday. As of early Friday, the secretary of state's unofficial election results showed Kobach ahead of Colyer by 191 votes. Kobach's office tweeted Thursday night that it "will begin collecting updated and unofficial election results for all contested national and state offices" beginning at 8 a.m. Friday. "... These results will include advance ballots by mail postmarked on or before Election Day, and any other unofficial election results that were not previously reported on election night," it added. The state office said the count will not include provisional ballot totals, which will be reviewed later. It said counties "must meet to review provisional ballots and certify the official election results between Monday, August 13 and Monday, August 20." Both Kobach and Colyer are "deeply conservative" candidates, as Scott Canon of member station KCUR describes, but Colyer employs "mild mannered" rhetoric, while "Kobach is more regularly confrontational, and he's built a national profile by challenging the registration of thousands of voters and authoring laws across the country aimed at cracking down on illegal immigration." Colyer inherited the governor's job from his predecessor Sam Brownback, who left to be an ambassador at-large for religious freedom for the Trump administration. President Trump endorsed Kobach in a tweet Monday. Kobach was co-chair of Trump's short-lived voter fraud commission, which Trump dissolved in January. 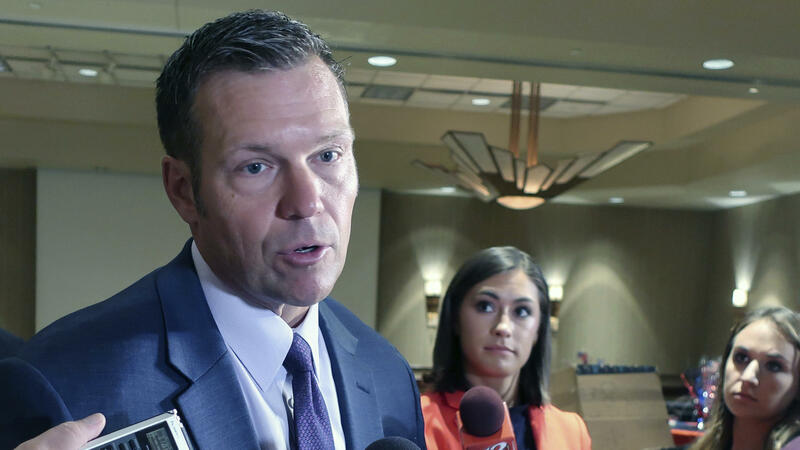 Kobach "has long claimed there is widespread voter fraud by noncitizens despite providing no evidence of any such improprieties and only prosecuting a few fraud cases in Kansas," NPR's Jessica Taylor noted. The winner of the Republican primary will face Democratic state Sen. Laura Kelly of Topeka, who handily won her party's nomination Tuesday, along with businessman Greg Orman, who is running as an independent.